Despite his fantastical appearance – Hellboy is half human, half satanic beast – the Hellboy slot itself leans to the more traditional side. The usual 5x3 set of reels are in place, with 20 paylines ample to provide a decent platform for winning combinations. When it comes to the visuals, Microgaming has served up a treat too. 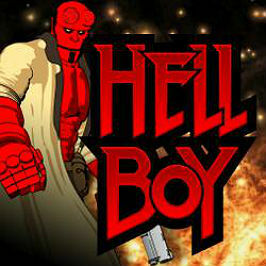 The dramatic ‘comic noir’ feel ensures Hellboy looks unique amongst its contemporaries. The main game is made up of playing card symbols and characters from the comic book series. If you've never read these or seen the Hollywood movies then consult the paytable for more information! 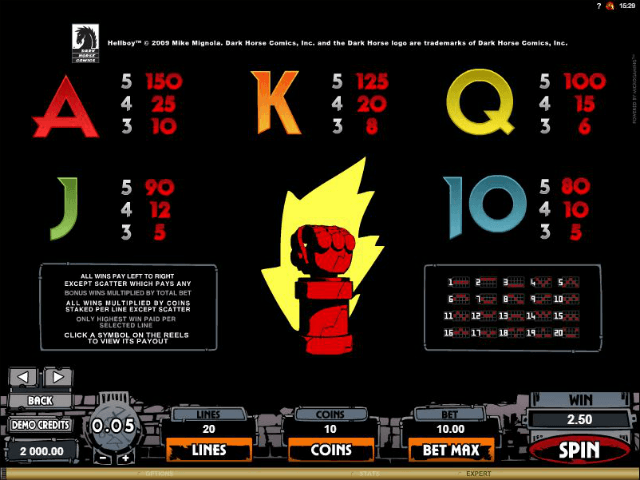 Hellboy online slot features a wild in the form of the Hellboy logo, which substitutes for all symbols apart from the scatter. Any subbed wins are subject to a 2x multiplier as well. The scatter symbol is the fist, which is a symbol of Hellboy’s resistance of his oppressors. This also pays out up to 500 coins for matching five on your reels from left to right and triggers the Underworld bonus, so that’s a very happy double whammy for players! 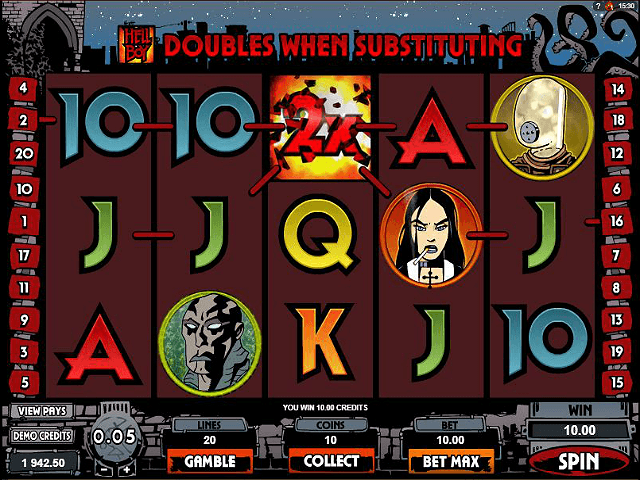 One of the best features in the Hellboy online slot game is flexibility. Gamers have maximum control and can shape exactly how they play. Any number of paylines from one to twenty can be set, which will naturally have an impact upon how much you wager with each spin. You can select your own coin amount from 1-10, too, meaning players of all budgets can enjoy some Hellish action as and when they please. Remember, winning combinations have to be spun from left to right, although scatter wins pay out anywhere on your reels. 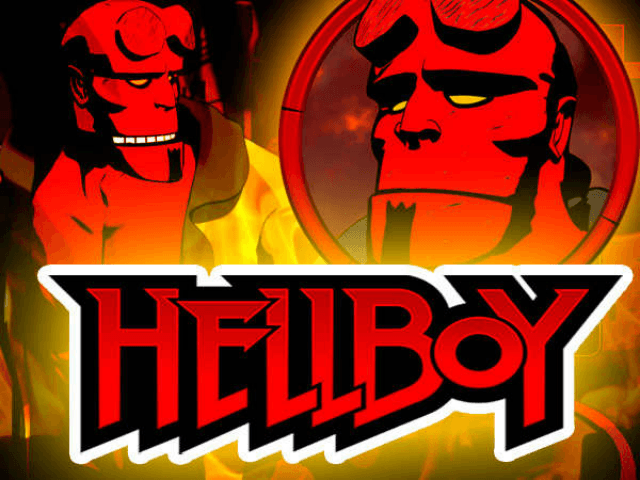 There are two bonus features in this Hellboy slot, both of which are home to the game’s premier payouts. 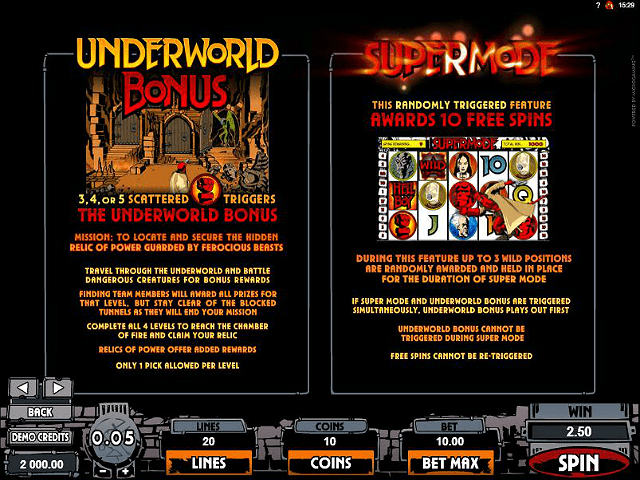 First up is Supermode, which is randomly triggered and awards ten free spins to lucky recipients. It is during Supermode that three wild positions are randomly dished out and held in place for the duration of the bonus, which can lend itself to some very handsome wins indeed. Second is the Underworld bonus, which is triggered when three or more scatters are revealed. This takes the form of a mini game, with the object to find your gang of anti-heroes before you head down a tunnel with no end, which ends the bonus feature. Achieve this and you will clear the level. Complete all four levels to reach the Chamber of Fire and collect the Relic of Power, which is the grandest prize on offer. If you like Hellboy - You'll like these slots too!